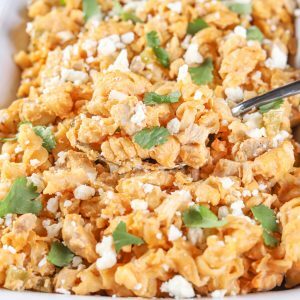 This Lightened Up Slow Cooker Buffalo Chicken Pasta recipe is a healthier twist to classic comfort food! All you have to do is mix the ingredients together, and let your slow cooker do the work for an easy meal that can be enjoyed any day of the week! *This recipe is created in partnership with Gold’n Plump®. As always, all opinions are still my own. 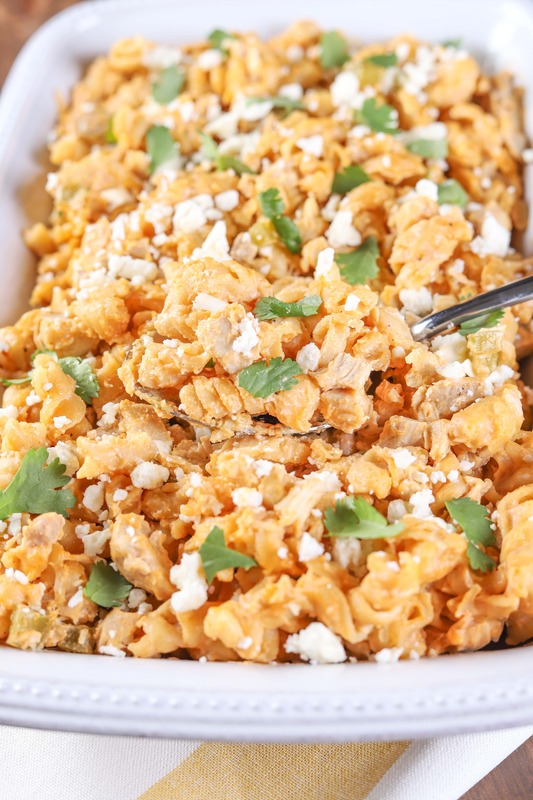 What is it about the buffalo chicken combination that makes it so good to eat in many different forms? 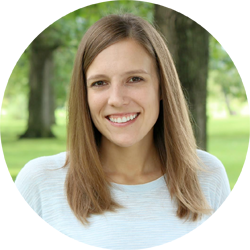 Just on this blog there are dips, quesadillas, fries, and lasagna! And why do we typically only eat it on game day? I think that it should be allowed to make an appearance on days other than game day. 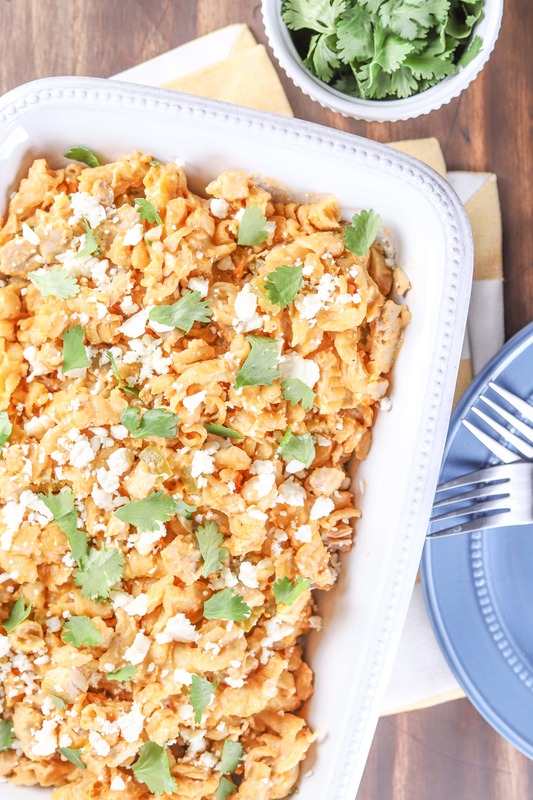 And with this lightened up slow cooker buffalo chicken pasta you don’t have to feel bad eating it any day of the week! Now you can enjoy a game time favorite without all of the fat, sodium, etc. that goes with it. And, as an added bonus, you can make the entire thing in a slow cooker! This pasta starts out by making a batch of chicken thighs in the slow cooker. Remember these grilled pineapple chicken strips I shared earlier this summer? Well this pasta uses the same Gold’n Plump brand of high quality, fresh chicken. Gold’n Plump, a Pilgrim’s brand, raises chickens on family farms in Minnesota and Wisconsin. Their chickens are given locally sourced nutritious feed rations created by a nutritionist. Their chicken is also all-natural with No Antibiotics Ever and no added hormones. In fact, their entire product line is raised without antibiotics of any kind. Plus, the chicken is hand-trimmed and free of unwanted ingredients and solutions, so you get high quality, fresh tasting chicken to feed your family! Once you get the chicken thighs in the slow cooker you add in some seasoning and liquid, and let it cook. Easy. When the chicken is cooked, you add in the the rest of the ingredients, minus the garnishes, and let the slow cooker finish off the pasta for you! 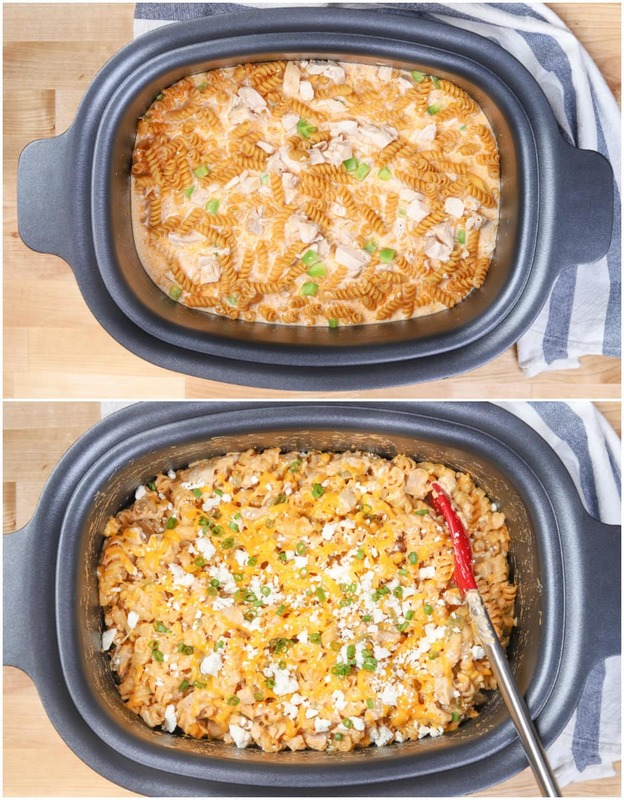 An easy meal that your family can enjoy on days other than game day! So, how is it healthier? 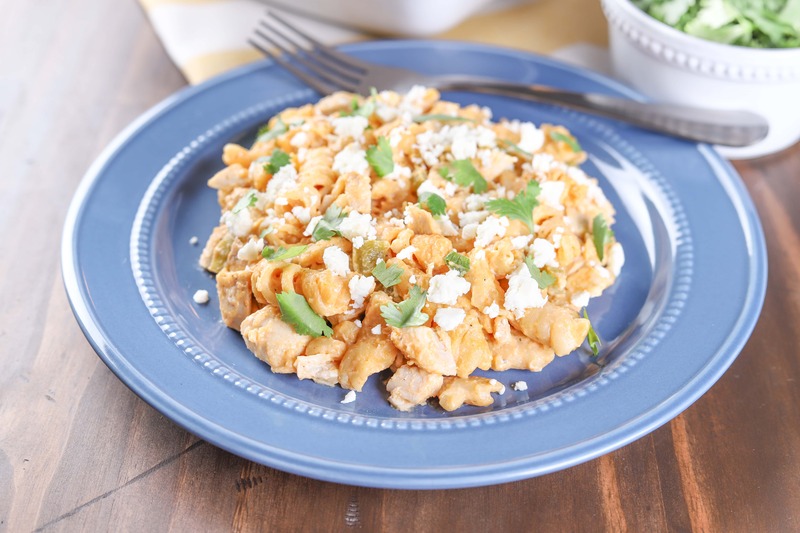 Most buffalo chicken pastas contain lots of heavy cream, ranch dressing, and loads of cheese. You won’t find any cream or ranch dressing in this recipe! Plus, we used extra sharp cheddar instead of mild cheddar so you can get the cheese flavor without using lots of it. Other simple swaps include whole wheat pasta for regular and 1/3 of the fat cream cheese for full-fat. Fresh bell pepper, garlic, green onion, and cilantro add loads of flavor, so you won’t notice the lack of all that cream and cheese! Why use chicken thighs? Chicken thighs have a lot more flavor than chicken breasts, and using them with a strong flavor like buffalo sauce allows you to still notice that there is chicken in the pasta! The chicken thighs also stand up to being in the slow cooker for a longer amount of time if you can’t make it home right away to do the next step in the directions. Temperatures vary by slow cooker. If you want to avoid having mushy pasta, make sure to stir and check the doneness of your pasta every 15-20 minutes once you add it. You can always up the amount of buffalo sauce in the pasta if you like a lot of spice. I like some spice and thought 1/2 cup was perfect. My husband likes a lot of spice and thought that the pasta could have used 2/3 cup of sauce. 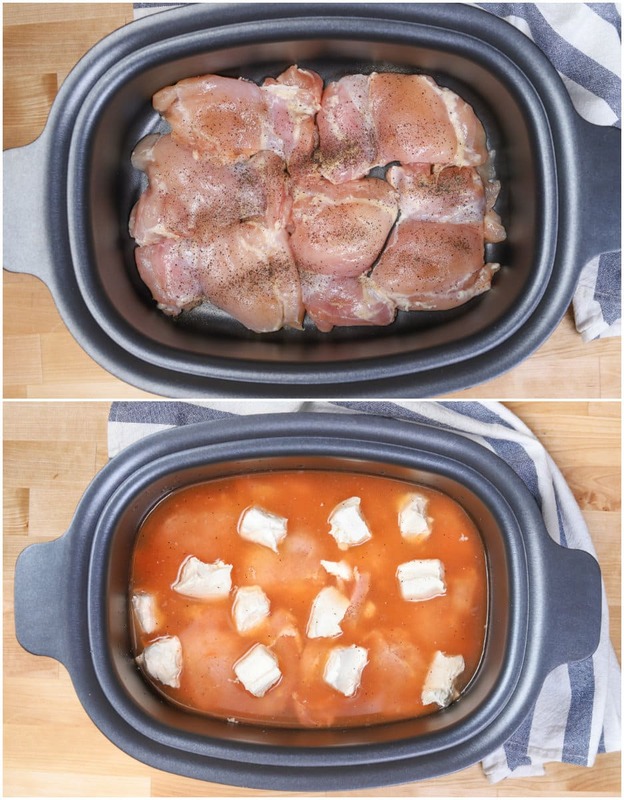 Place chicken thighs in a single layer in slow cooker. Sprinkle with celery salt and black pepper. Top with garlic, 3 cups chicken stock, and ¼ cup buffalo sauce. Swirl the liquid a bit to incorporate the buffalo sauce into the chicken stock. Top with cubes of cream cheese. Cook for 2-3 hours on high or 5-6 hours on low, or until internal temperature of chicken reaches 165 degrees Fahrenheit. Remove chicken from slow cooker. Add in remaining ½ cup chicken stock and ¼ cup buffalo sauce to slow cooker. Whisk until cream cheese is fully incorporated into liquid. Cut chicken into small pieces. Return to slow cooker. Stir in pasta and bell pepper. If cooking at low heat, turn slow cooker to high. Cook for 30-60 minutes, or until pasta is done. Check doneness of pasta and stir every 15 minutes to make sure that the edges get cooked as well as the center. Turn off heat. Sprinkle with cheddar cheese, ¼ cup feta cheese, and green onion. Cover and let sit until cheese is melted. Stir to incorporate melted cheese. 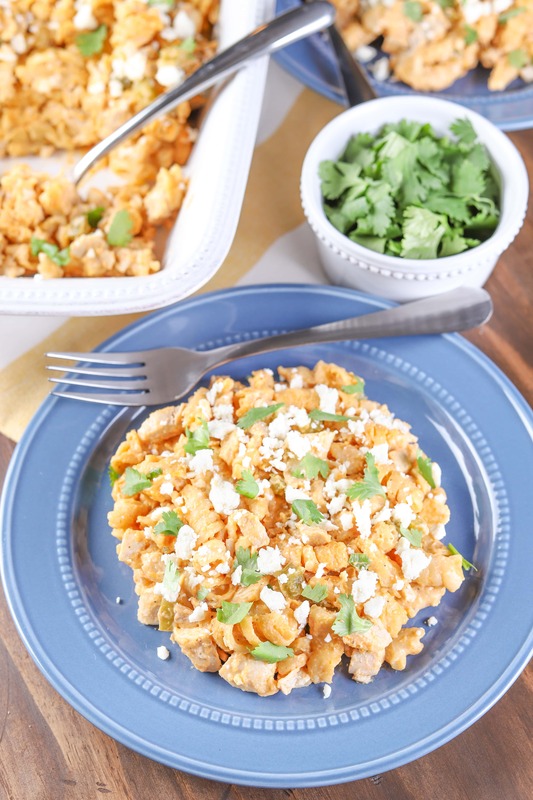 Serve with remaining ¼ cup feta cheese and chopped cilantro/parsley. Be sure to check out Gold’n Plump on Facebook, Instagram, Pinterest, and Twitter for more recipe inspiration! Interested in what other products Gold’n Plump has to offer? Check out their entire line of All Natural products on the Gold’n Plump website.